Reid Glacier calving in the distance, humpbacks playing 100 feet from our dinghy, Stellar sea lions bellowing on North Marble Island, and La Perouse, a pinnacle of majesty over Dundas Bay, was all it took to get me hooked on the adventure I hadn&apos;t even known existed a week earlier. Alaska was profound for me. I got off an airplane in Juneau, found a friend&apos;s boat in Auke Bay and suddenly was immersed in scenery and wildlife too moving for words. Best of all, there were no people (don&apos;t get me wrong, I like people, just not in volume). My friend, Vince, has a knack for introducing me to new ways of viewing the world, whether in running my business in Santa Fe, New Mexico, or cruising aboard his Krogen 42 in Glacier Bay. Where in the world was I that I hadn&apos;t a clue this trawler life existed? A life that allows one to go anywhere the sea flows? The answer was that I was building a business in the high, dry desert of New Mexico. That&apos;s hardly a place for an ocean-going trawleryacht experience. I had had no idea what to expect in Alaska. Unbeknownst to me, my business was to be forcibly acquired within a few short months after that holiday aboard Vince&apos;s trawler in summer 2000. Initially, I felt as though a tragedy had befallen me and yet, as the months unfurled, I clearly realized the universe provides for us in strange, often unexpected, but in ultimately perfect ways. For several months my team of lawyers, accountants and business consultants helped me negotiate through what felt like business purgatory. I knew that once the divestiture was completed, I needed to find a new life, or at least find out who I was after nearly 20 years of business building. I realized then the purpose of my time aboard Vince&apos;s trawler in Alaska, and I went off to the Lake Union Boats Afloat Show in Seattle. . Walking along the docks at Chandler&apos;s Cove on Lake Union, salivating at my first-ever boat show, I was taken by the first boat I boarded, a Krogen 54, one of eight built in the late &apos;80s. Beautiful teak aged to a light glow, an unusual canoe stern, a portside interior passageway and a stately pilothouse with forward-canted windows, all contributed to this greenhorn&apos;s sense of wonder and my overall positive impression of this Alaska trawler. I was off to see other boats, probably even more impressive, or so I thought at the time. My brother, Mark, and I spent a day meandering in and out, up and down and on and off the many floating objects that inhabited this wondrous new water world. As the first day of sensory overload came to a close, I ventured over for a last look at the Krogen 54. After seeing all the brand-new boats of the show, I realized this Krogen looked a little tired. Worn fabrics and carpet, sleep-dented mattresses, a dingy engine room and tired paint lent a well-used aura to her. Still, it had a curiously dignified presence, a salty profile and beautifully lightened teak woodwork unmatched in the newer boats I toured. I was smitten. I could hardly contain my boyish excitement the next morning as Mark and I ate a hearty breakfast complete with potent Seattle coffee and waited for the 11 a.m. boat show opening bell. Walking, nay jogging, to the stately Krogen at the Passagemaker Yacht Sales dock, yet trying my damnedest to be cool, calm and certainly not anxious (lest I reveal my vulnerability to the broker-sharks! ), I asked a handsome, silverhaired broker whose name tag read "Greg Matthes," to answer a few questions about this tired older Krogen. Stepping aboard, Mark, Greg and I took seats around the comfortable saloon settee and began talking trawlerspeak. I warmed up to Greg immediately. He seemed atypical compared to the gold-chained brokers crowding the new, seemingly identical Tupperware boats. I asked Greg all the boat questions my novice mind could think of. "How well was this boat taken care of? How much life expectancy is left on the hull, engines and major components? How much "refit" money would this boat require vs. buying a newer Krogen? As an aspiring trawlergeek, what should I look for in buying a boat?" Greg answered all my questions with an earnestness that relaxed and disarmed me. Never shying from important decisions, I had a strong intuition this boat was just what I needed. "So," I said, "how do I take the next step?" "What next step?" Greg asked. "You want to buy this boat?" Greg asked incredulously. "I think it&apos;s the right boat, and I&apos;d like to make an offer. Is that a problem?" I may have acted quickly but had experience making small business decisions and I was careful and serious, and even scared to death, despite my new love of boating. This boat-buying story would not be complete without a discussion of marital basics, specifically communication, and, more specifically, the wisdom of consulting one&apos;s spouse before making a major purchase. Now, my wife, Liddy, is very understanding and a wonderful partner. However, marrying later in life, I&apos;d never consulted anyone when I&apos;d needed to make a decision or wanted to buy something. This character flaw was even further exacerbated by all the entrepreneurial decisions needed as one grows a business. Upon returning home to Santa Fe and after properly greeting my wife and cats, I told her about my great weekend and blurted out, "Honey, I bought a boat!" Liddy, not knowing much about boats and thinking "rowboat," said things such as, "that&apos;s nice, tell me about it," and "how much did it cost," to which I naively explained a little about my purchase. To make a long story short, I have a new understanding of the requirements needed to make a marriage successful. I also learned that including one&apos;s partner in a decision-making process increases her interest in participating in the cruising portion of trawler ownership. That was something I would struggle with as I embarked wifeless on my initial sea-going adventures. Off and on, as my business demands permitted, I spent nearly 50 hours practicing boat handling and navigation with as many seasoned skippers, including Greg, as I could con (and sometimes even pay) into passing along their maritime knowledge. I took my new boat through Seattle&apos;s Ballard Locks four times! Luckily, Southwest Airlines had a non-stop flight to Seattle from Albuquerque that allowed me to conveniently check on the other part of my boat project, the refit. Realizing I didn&apos;t want someone else&apos;s used boat to be my first yacht, I embarked on a refit that gave me intimate awareness of the term "boat bucks." And, with the help of Greg&apos;s 20 years worth of messing about with boats in Seattle, I became intimately familiar with the best boatyards on Lake Union. I also became aware of how expensive this process is, spending about $250,000. I figured I had three major areas to upgrade: the engine and mechanical systems, interior and exterior cosmetics and the navigational and safety equipment (plus countless minor details I wasn&apos;t yet aware of ). I began with lists, and new and longer ones every month, as I came up with more and more great ideas. Happily, I found myself immersed in this boat project that was absorbing and redirecting my life away from the transition that was occurring in my business. Over the course of eight months, Ken Morris&apos; crew at Ocean Alexander Marine Center, the Krogen warranty boatyard, spent hundreds of hours aboard Europa, my Krogen&apos;s new name. They installed Wesmar fin stabilizers, an autopilot that interfaced with Nobeltec navigational software, a rebuilt Espar forced-air heater, a new water/engine heater system, a rebuilt windlass, a new crane/winch system for the 13-foot heavy-duty Zodiac RIB, a foredeck mount for a new rowing dory, an ICOM VHF radio, a Force 10 marine stove, a Sub-Zero refrigerator and new lighting throughout. 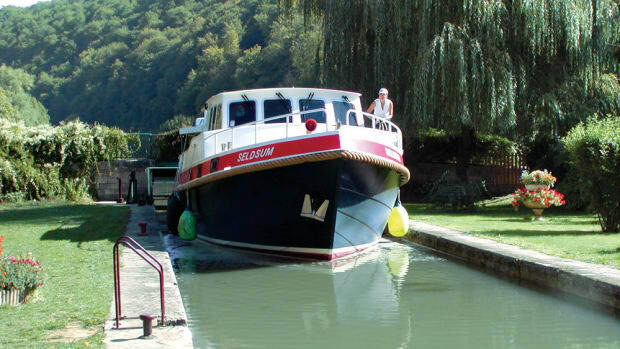 I contracted with others to replace fabrics throughout Europa, including mattresses and covers on all six beds, carpet throughout, new saloon and cockpit seating and a new pilothouse watchberth and helm chair. The exterior was made over from a faded sea-blue to a forest-green color scheme. We added new dodgers and canvas all around, including sail covers (yes, Krogen 54s all are ketch-rigged). Europa was beginning to have a different look about her. She was standing smart and tall as if beginning a new life. I was, too. A special Awlgrip paint color called barnacle green was applied to sheer and boot stripes and a swim platform was added. Europa&apos;s plentiful teak work was revarnished and white paint that covered the pilot and deckhouse&apos;s teak eyebrows and accent trim was removed. My Krogen was being transformed. Europa&apos;s 6068 John Deere engine was serviced and upgraded, including a new starter, fuel-injection pump, heat exchanger, crankcase fume-recirculator, wet-exhaust system, injectors, as well as most belts and hoses. Bilge and temperature alarms were added that helped keep me from worrying, until I was able to develop an innate sense of my boat. The Northern Lights 8kW and 20kW gensets also were serviced and ready to go. Go, that is, to Alaska. My previous year&apos;s adventure had been such a turning point in my life that I had to go back. But this time in my own trawler! Never wanting to live life halfway and learning best by immersion, a voyage to Alaska seemed the logical next step. Preparing for a three-month cruise took much planning because I never had cruised, aside from my week aboard Vince&apos;s trawler the summer before. The other challenge was to organize a crew for the many legs such a trip would require. Not everybody has the flex schedule bestowed on me by my business transition. It was a beautiful June day complete with occasional light showers intermixed with bouts of sunshine. Liddy accompanied me through the Ballard Locks from Salmon Bay to the saltwater of Puget Sound with the help of Greg and his wife, Kris. Dropping our lockhands off at Shilshole Marina, Liddy and I headed north to Port Townsend. We visited Friday Harbor and docked at the floats in front of the Empress Hotel in Victoria, British Columbia. Because my wife loves Victoria we spent two wonderful days enjoying this beautiful city, which never would be complete without a visit to Butchart Gardens. It also was a high point for a fitting and happy end to the first leg of the journey. We were sad to say goodbye, but I could tell that my wife, being somewhat uncomfortable with my budding boat-handling skills and the rough ride across the Strait of Juan de Fuca, was not altogether unhappy to let me fine-tune my maritime skills before she ventured farther on Europa. I could not help but agree. The next crew to arrive was the women: my mother, sisters, Beth and Rebecca, and niece, Ana. I think they trusted me more than might be expected of such a new captain, and because all of us were new to the water world, a healthy optimism prevailed as we headed across Georgia Strait to Vancouver and Coal Harbour Marina. Vancouver is one of those cities that seem somewhat otherworldly when one is moored in the center of downtown beneath towering skyscrapers. Peacefully floating on Europa in the core of a teeming metropolis was truly a surreal experience, especially when coming from a high desert, mountain community of 65,000 people. An enjoyable Vancouver visit, extended due to a dysfunctional alternator, was nearing a close, as we looked apprehensively northward to the area ominously called Desolation Sound. Arriving at Refuge Cove, the hub of the popular cruising area, we realized desolation was not an apt moniker. We saw all descriptions of boats, from 25-foot fishboats to 85-foot slick luxocruisers, crowding the waterways. We even found a Starbucks sign hanging near a funky outdoor café. 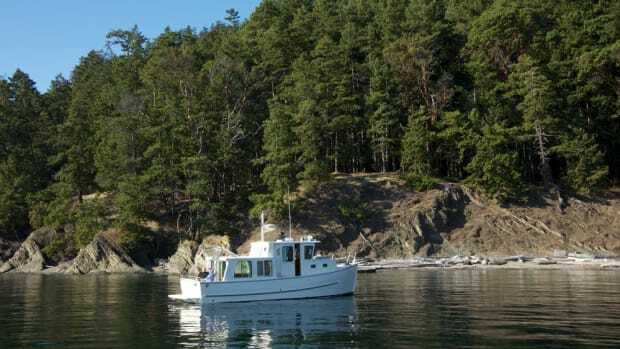 Wanting a bit more serenity, we cruised up Pendrell Sound only to find nowhere to anchor comfortably because the depth sounder registered 9 feet right next to the water&apos;s edge. Stern and bow ties seemed in order and having never tried such a maneuver, I completed it with reasonable success in just less than two hours (all the while the women wondered what I was doing and why I was so perceivably frustrated). After exchanging warm goodbyes to the wonderful, seafaring companions the women turned out to be, I welcomed my third crew at Refuge Cove&apos;s float plane dock. David, his wife, Kerry Ann, and their daughter, Teal, arrived from Austin, Texas, and excitedly boarded Europa ready to continue the journey northward. After cruising a few short hours, we anchored for the night again, with a stern tie. Following a swim in the warm waters of Walsh Cove Marine Park, we opened a bottle of vintage Cote du Rhone, and toasted the beautiful July evening and the beginning of a grand adventure. A voyage would not be complete without a linecaught- in-the-prop episode. As I was backing down to set the anchor in the mud of Port Harvey, off Johnstone Strait, the engine slowed as I heard Kerry Ann yell to stop. With the engine idling, I ran to the stern to see the small anchor line from the Zodiac, which we had been towing, extending into the murky deep. For the next two hours, David and I took turns diving in very cold water trying to free the prop. Only able to stay under water briefly, we would run to the engine room to regain warmth. A friendly couple from an older, but well-cared for Alaskan trawler paddled belatedly over in their skiff to offer a wetsuit as we wrenched the final melted rope from the propeller shaft. Their gesture was greatly appreciated, nonetheless. It soon was time for Kerry Ann and Teal to return to Austin. David was on sabbatical from a microchip-manufacturing firm there, so he continued north with me. Poking Europa&apos;s nose in and out of waterfalls, and anchoring in secluded coves surrounded by rain-drenched fir trees, we journeyed ever closer to Alaska. Leaving the northernmost British Columbia port of Prince Rupert early one morning, we cruised on the most placid of seas toward Alaska. I&apos;d heard of rough waters in Dixon Entrance, but this morning the sea god Poseidon was keeping a watchful eye on these new sailors. As evening softened, we docked in Thomas Basin under an unusual, cloudfree Ketchikan sky next to tough-looking fishboats right out of the movie, The Perfect Storm. I must say, being a newbie trawlerite, I felt like a no-good yachtie next to the real men of the local fishboat brigade as they observed my clumsy docking procedure. Still uncomfortable in the water world, I was somewhat intimidated by the larger workboats and was attempting to masquerade as one of them. Learning by immersion has its drawbacks. On to Fool&apos;s Inlet and a Zodiac ride to Anan Creek Bear observatory where we encountered not a soul, save a few black bears gorging themselves on the special of the day: fish heads and caviar. Certainly the bears weren&apos;t lacking in choice as scores of sluggish salmon turned the river black. Headed toward Wrangell and Petersburg, we dodged the Taku, an Alaska Marine Highway ferry, while negotiating the water slot called Wrangell Narrows. Plying the unusually calm waters of Frederick Sound, north of Petersburg, we turned Europa eastward into Tracy Arm. Tracy Arm is one of those larger-than-life places I&apos;d heard about that truly lives up to my mind&apos;s image. With its sheer walls of granite and ribbons of water cascading to the greenish-gray waters of the glacial fjord, Tracy Arm was a feast for the soul. At North Sawyer Glacier, I lowered the kayak off the pilothouse roof and paddled closer to the deep waters washing the blue-black crevasses of the glacial face. A few calving bergs too close for comfort sent me scurrying back to the good ship Europa, but not before I snapped a few good photos of her in front of the imposing glacier. We traveled to Juneau and up the Lynn Canal (read: dramatic fjord) to the charming towns of Haines and Skagway. After nearly running aground in Skagway Harbor because of strong winds, David and I sought refuge in a wonderful dockside restaurant. We enjoyed dinner while listening to Bob Dylan and Van Morrison tunes. That evening I understood the boating term, "a port in the storm." Bicycling the next day as far as we could up Chilkoot Pass, made famous by a sort of death march to gold fever, we literally ran into a black bear sauntering along the trail. As we raised our arms to make us big in the eyes of our startled foe, I couldn&apos;t help but sense the sheer terror all three of us felt. I can see how wars can be a consequence of our fear of each other. Skagway, 1,000 miles north of Seattle, was the northernmost part of our journey. From now on I would be steaming (too fast a term, I&apos;ll say chugging) 8 knots in a southerly direction. Next stop, Glacier Bay, where one year earlier I had discovered the world of trawlering aboard Vince&apos;s Krogen 42. The next day, we cruised to Margerie, the quintessential glacier photographed in cruise ship ads promoting Alaskan holidays. Approaching the 300-foot-high glacial face, we realized we&apos;d have to share this compelling and solitary experience with the 2,000-odd camera-toting passengers on board the Dawn Princess floating in front of Margerie. In spite of the masses experiencing glacial wonder, I piloted Europa smack-dab between the glacier and the cruise ship as everyone shared the spectacular view of the calving ice wall. I realized later the M/V Europa would be in videos and snapshots all over America as our cruise-ship companions viewed their summer Alaskan vacation mementoes. Continuing south down Chatham Strait, we sailed into Warm Springs Bay where we enjoyed a relaxing soak in Baranof Hot Springs before dropping anchor the next day in Berg Bay. This beautiful and sheltered inlet in Alaska will remain etched in my consciousness forever. That quiet evening, we floated on what looked like glass reflecting a crimson sunset sky, a rarity in Alaska. We had not seen another boat for hours as we enjoyed our evening meal and a late-night cigar with a glass of Irish whisky, all the while feeling as if life couldn&apos;t get any better. Alaska empties of visitors in September, and I felt that especially true this still evening of Sept. 10, 2001. I was awakened early the next morning by the incessant ringing of the satellite phone. Bolting out of bed and winding my way up to the pilothouse, I answered the phone, still half asleep. My wife&apos;s distraught, pained voice penetrated with the sickening news of the 9/11 disasters. Now fully and incredulously awake, I knew this news, relayed by my Manhattan-born wife, marked the end of my journey. It was time to high tail it back to Seattle, a journey of two weeks. Arriving three days later in Ketchikan, we watched the news, along with the rest of the town, on a big-screen TV in a local sports bar. 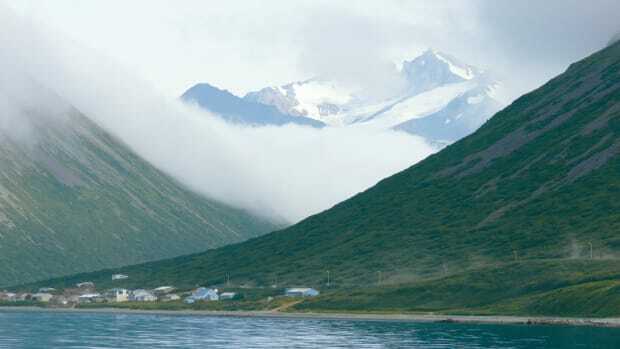 Resupplying for the remainder of our voyage, we departed Alaska and entered the large body of open water called Dixon Entrance and headed toward the Canadian border. Leaving Alaskan waters, we were stopped mid-sea and boarded by the U.S. Coast Guard. No sooner had we completed the American high-alert check, we were boarded by the Canadian Coast Guard for another full-boat inspection. Sufficiently shaken with the knowledge that the world had changed, we cruised southward, on a largely deserted, late- September ocean toward Seattle. Consistently gray skies reflected our somber mood as we passed the coves, waterfalls and dramatic landforms that had greeted us two months earlier. Passing Bella Bella, Port McNeill, Campbell River, Nanaimo and the Gulf and San Juan Islands, we crossed the Strait of Juan de Fuca and, again, were back in the United States. Oddly enough, we cleared U.S. Customs near Port Townsend by VHF radio, a stark contrast to how we entered Canadian waters two weeks earlier. As Europa entered the locks at Seattle&apos;s Shilshole Bay, completing our saltwater journey, I felt twinges of sadness and apprehension, as well as a bit of optimistic anticipation as I wondered how my terra-firma life would be different. My business had changed and the world certainly seemed a different place. My voyage along the Northwest Passage initially was intended to help me gain perspective on my life and help me navigate the changes that had occurred. I hadn&apos;t expected the whole world to change. Ultimately, my personal Northwest Passage was just one of many metaphorical buoy markers I had passed in my life. I loved the independence of a life I never knew existed. I only wish 9/11 had been a buoy marker, not a watershed event in the history of the world. Postscript: Holland, a real-estate investor and owner of two Saab dealerships in Santa Fe, took Europa to Desolation Sound and other popular anchorages during summer 2002. He also worked with Jonathan Edwards, host of Cruising America&apos;s Waterways, filming a segment in Puget Sound, the San Juan Islands and Victoria, B.C., that will air in the fall on the Public Broadcast System. In February, 2003, he traveled to the British Virgin Islands to learn how to operate a sailboat because he wants "to learn all he can" about cruising. Another trip to Alaska, this time with friend Vince, is planned for May 2003.